The house is wrapped in Autumn splendor, the scent of fresh baked goods waft through the air and a hot cup of apple spice tea embraces me in the afternoon sunlight. Oh you are awesome. How do you work and get it all done? I love your cozy family room and all the light you get. I am downright jealous. Oh Patty, you make me want to come sip tea with you in your cozy living room!! Sounds good sipping tea, reading a book and relaxing with a good book. I love autumn also. I know just what you mean. Your fall fluffing makes things so warm and welcoming. I could be very happy sitting in this cozy corner. It is all so pretty. I really like the lamp shade and wonder why I haven't found such a perfect one for my home. Enjoy the rest of October! October is my favorite month. Not sure if it's because I'm an October baby, but it's always been my favorite. I love the promise of cooler temps and the flavors and fragrances associated with autumn. Your room is so cozy and bright...wonderful! I love October as well...almost my favorite month!! Oh wow, this room looks lovely! Don't you just smile every time you walk in? Have a great fall day! I especially love this fireplace. I have been wanting to paint mine for quite some time. What a sweet photo of a very cozy place. Pretty as can be! That new fabric is awesome. It makes your room so bright and welcoming! I love my woodstove, but always wanted a mantle to decorate. Your looks great. I love yellow in decorating, so I really like the fabrics used in your room. that wicker chair next to the fireplace looks like a cozy place to read a book too. Can't wait to see the big reveal of your "new" room! Have a great weekend. Sooo cosy! I enjoyed your pictures, how lovely you have made your room. Have a happy weekend. What a cozy, warm, and so inviting space you have created. You should write a book on how to decorate. 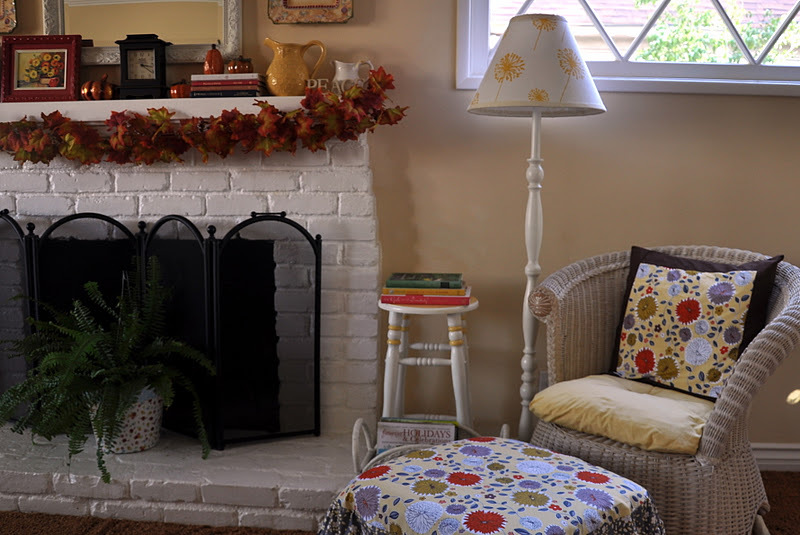 Autumn and your painted fireplace, are the perfect combination! Wish we could have coffee there.